Interest rates have been low for so long it’s tempting to think low rates are the new normal. So when the Reserve Bank suggests that a cash rate of 3.5 per cent is the new ‘neutral’, people take notice. Even the Prime Minister warned Australian householders to prepare for higher interest rates ahead. (i) That’s good advice, even if no-one is suggesting an interest rate hike is imminent. 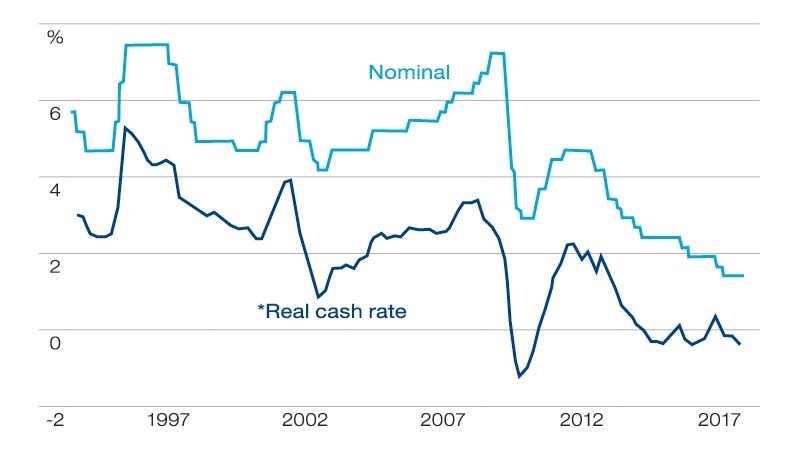 The official cash rate has been held at a record low of 1.5 per cent since August 2016 to stimulate economic growth in non-mining sectors of the economy in the wake of the mining boom and the global financial crisis. However in recent months the Reserve Bank has begun preparing the ground for higher rates. In the minutes of its July meeting, the Reserve Bank said it now considers the ‘neutral’ cash rate to be 3.5 per cent. Neutral is central bank-speak for the sweet spot where growth is supported without pushing inflation too high. Annual wages growth is currently running at below 2 per cent, which means many workers are not receiving any real increase after inflation is taken into account. The annual rate of inflation eased from 2.1 per cent to 1.9 per cent in the June quarter, below the central bank’s 2-3 per cent target band. The central bank is also reluctant to put more pressure on borrowers while household debt grows faster than income. The level of household debt to income has increased from about 148 per cent in 2012 to a record 190 per cent in March 2017, among the highest in the developed world. For households with a mortgage, the figure is closer to 300 per cent. While rates appear to be on hold for the moment, there is little doubt that the next move, when it comes, is likely to be up. So what can you do to make the most of today’s low rates and soften the impact of higher rates in future? Make the most of low interest rates to pay down expensive debt such as credit cards and personal loans. Credit card interest rates begin at around 12 per cent and rise to as much as 20 per cent on popular rewards cards. One strategy is to consolidate personal debts into your mortgage and save up to 15 per cent in interest. You also need to increase repayments on your mortgage, otherwise you could be paying off your credit cards for 20 years or more. If you have a mortgage and an increase in interest rates would blow a hole in your budget, then think about fixing all or part of your loan. The best fixed rates for two and three-year terms are currently around 4 per cent, not much more than the best variable rates on offer. Bear in mind that fixed loans are less flexible than variable loans. You can’t make extra repayments or redraw funds and there are penalties for exiting a fixed loan early, even if it’s to sell your home. One popular solution is to split your loan into fixed and variable amounts for peace of mind with the flexibility to make extra repayments or redraw funds if necessary. If you have a variable rate mortgage, then it’s a good strategy to use any extra savings or lump sums to reduce your loan while rates are at historic lows. You can tip this money into an offset account where it will reduce the interest you pay, but this only works if you’re disciplined and avoid the temptation to dip into your offset account for everyday spending. You may be better off making additional ongoing or one-off loan repayments; they will still be available for a rainy day if you choose a loan with a redraw facility. Higher interest rates are not all bad news. 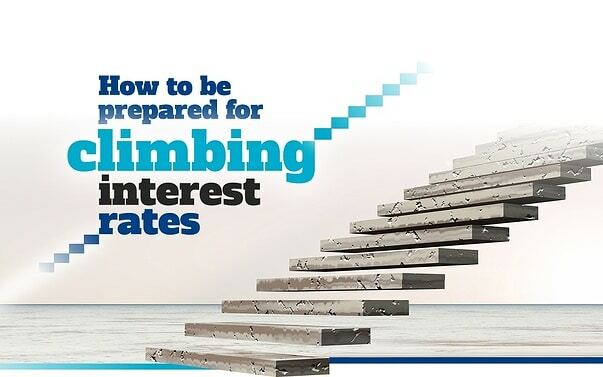 If you’re a saver or depend on income from investments, higher rates can’t come quick enough. Once rates begin to move, don’t automatically open a savings account or roll over a term deposit with your existing bank. Check online comparison sites such as Canstar, Finder or Rate City to see if you can get a better deal elsewhere. Even now, you can get 3 per cent on some high interest savings accounts, which is a lot better than the below 1 per cent rate your money earns in an everyday account. When rates begin to move, it pays to get on the front foot. If you would like to discuss ways to reduce debt or grow your savings and investments, don’t hesitate to call.